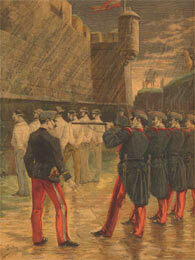 On this date in 1894, on the very day that anarchist terrorist par excellence Emile Henry was guillotined in Paris, six more anarchists were executed by firing squad outside Barcelona’s Montjuich Fortress. Mariano Cerezuela, Bernat Siveval, Jaime Sogas, Jose Codina, Villarubbia, and Manuel Archs were condemned just weeks prior by a military court for complicity in the attempted assassination earlier that year of Spanish Marshal Arsenio Martinez Campos. Some had originally been rounded up in the general anti-anarchist crackdown after the bombing of the Liceu theater … although another man would be put to death for authoring that crime later in 1894. Only one of their number, Sogas, died penitent. [t]he condemned men were conveyed from the chapel, where they had spent the night, to the place of execution by an underground passage, the first two to appear being Sogas and Cerezuela. The former, who confessed last night, joined in the prayers offered by the priest, and he and Cerezuela walked quietly to their doom. The other prisoners, however, shouted all kinds of revolutionary cries. The convicts were placed in line, and at the first shot they all fell to the ground. It was found, however, that in the case of Sogas and Codina the bullets had not taken effect, and a second shot was necessary.